Download Hour1 Download Hour2 Rejecting the story of 'homo economicus' that normalizes selfishness. This week we begin with a remarkable talk from Greenfest 2009: John Doscher on Capitalism as Culture. 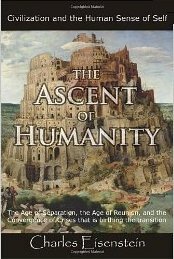 Next we begin reading chapter seven of Charles Eisenstein's Ascent of Humanity, where in he address the question of despair and optimism, and demurrage currency, a system of money that encourages cooperation and discourages accumulation. This page was last modified on 2 November 2013, at 02:05.